CASE STUDY: Trigger Job on a Kel-Tec P-11 pistol. This simple example demonstrates how the TriggerScan™ System is used to visualize the results of a trigger job performed on a pistol. Without the TriggerScan™ System, this trigger job would have been pure guesswork. The P-11 is a double action only, 9 mm pistol, with a double column magazine. It is advertised as a gun well suited for concealed carry and female shooters. Green. Out of the box, the trigger pull was very unpleasant. The trigger had a long pull and when it finally let off, the stress in my index finger was such that the gun's point of aim could hardly be maintained and my finger was painfully pinched between the trigger and frame. The only way my wife could successfully actuate the trigger was by using the fingers of both hands together. We decided a gun with such a trigger was unacceptable and firing it would have been a waste of ammo. The original trigger profile is shown in green. Note that the instrument revealed a noticeable "bump" towards the let-off point, which was likely the cause of the trouble. Otherwise, judging strictly by feel, I knew the trigger was bad, but I could not recognize the bump. Purple. I decided to reduce the bump. I took the gun apart and slightly rounded off the mating surfaces of the trigger bar and hammer using fine emery and verified the progress under a magnifying glass. The trigger felt a good deal better, but was still not acceptable. 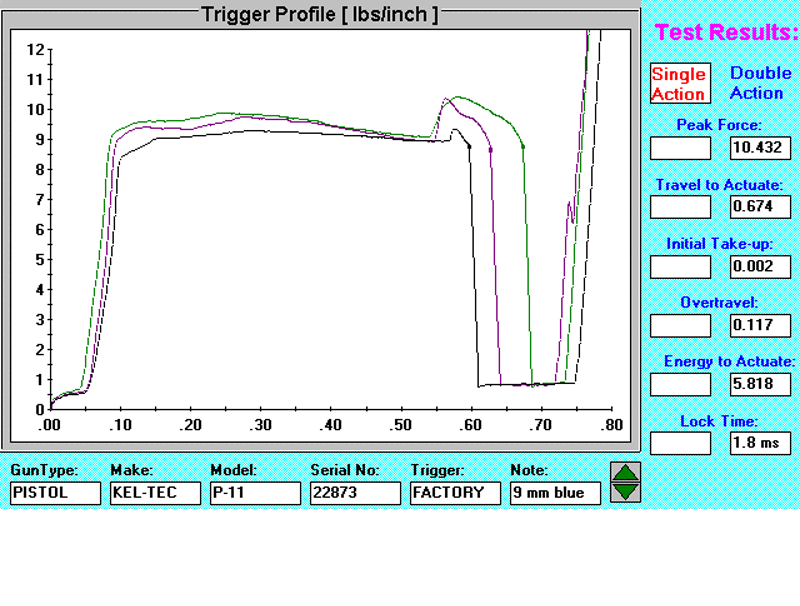 The trigger profile after the first modification is shown in purple. Black. I decided to tune the trigger even more, repeating the same procedure. The bump was almost eliminated, and the resulting trigger profile is shown in black. Compared to the original profile, I have managed to reduce the travel to actuate and the energy to actuate by some 20 %. Lawyers will not like me for what I have done, because now it takes 20 % less effort to cause this gun to fire. Note that the energy to actuate the trigger is graphically represented by the area under the curve. I realize, that by performing this job, I have also reduced the energy of the firing mechanism, and if I went too far, misfires might occur. I took the gun to the range and tested it. I can consistently place fatal shots on the target at 12 yards, shooting with one hand. This would have been unthinkable with the gun out of the box. I haven't encountered any misfires so far. To give some credit to this little pistol I must say that the smoothness of the trigger profile curve, not counting the one bump, is extraordinary. In fact, it rates the best of all the guns I have encountered so far. Also the lock time of 1.8 milliseconds is the shortest lock time I have seen so far, at least two or three times shorter than most other handguns. The gun functions well, with the optional finger rest it feels well, it is very light and simple. In my opinion the little gun is worth the money, and after I performed the trigger job, I have come to like it a great deal. Note: This study was performed on an early model P-11. Since then, the engineers at Kel-Tech improved the trigger design on their P-11 pistols. The ones currently produced are said to be better then the one I tested.